I do not look like a blogger to a female mosquito. I look like lunch: a big bag of nice warm blood. The bag is annoyingly mobile, but she is also mobile and is quite good at using a mix of cues (chemical, thermal, and visual) to home in on the bag. Then it will be time to lay eggs. From her viewpoint, my birdbath was a good place for egg laying until I rigged a hose to drip into it. 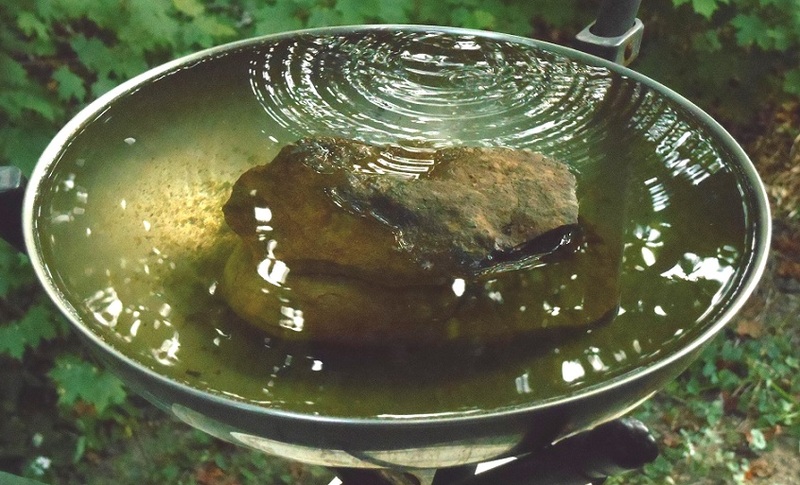 The dripping also keeps the birdbath full and makes it more attractive to the birds, who consider it a good place for a sip of water and sometimes a bath. From the birds’ viewpoint, it never was a good place for egg laying. I am glad that the mosquitoes have finally come around to the birds’ opinion. Blood for lunch does not appeal to me. Neither do caterpillars, so I do not compete with any past or present birdbath visitors for food. I eat something healthy (from a human viewpoint) and finish off with something obscenely healthy: a few raw carrot sticks and then a few raw snow peas. (That lets me get away w/o brushing my teeth after lunch.) I also view the veggies as colorful objects to be arranged in a very temporary display on the plate before they become ugly mush that is mercifully out of sight. 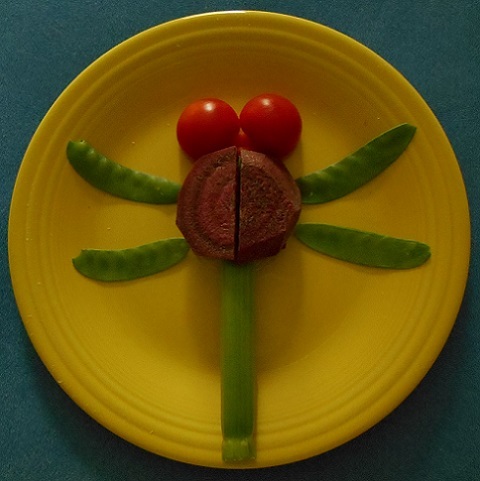 A few days ago, I happened to arrange my lunch veggies so as to look a little like a dragonfly, with snow peas as wings. Hmmm. There were more veggies in the fridge, and some of them would be wanted at dinner anyway. Maybe I could pull some out now and make an arrangement that looks a lot like a dragonfly, at least from my permissive viewpoint. (No real dragonfly would be fooled.) The result was good enough to remind me that a dragonfly is the enemy of my enemy, and thus my friend.